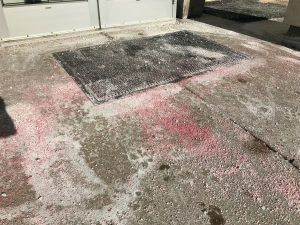 Home/News, Tips, Uncategorized/Don’t Over-Salt Building Entrances!!! Safety precautions must be taken in freezing temperatures but excessively salting the entrance to a building takes a serious toll on the floors inside. 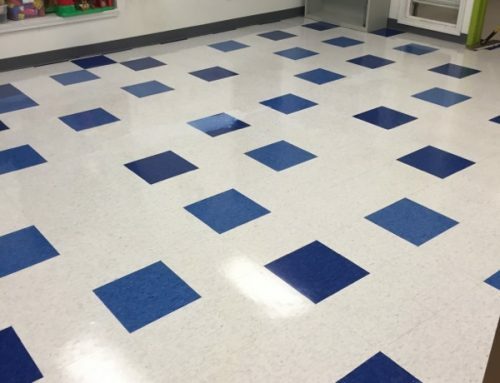 Rock salt will damage the finish on VCT when ground into the floor by foot traffic, stain carpeting making it unsightly and is also very difficult to completely clean off of resilient floors daily giving the facility a dirty appearance. Cold weather alone does not call for an application of salt or ice melter- precipitation or the possibility of melting snow to turn to ice if the temps dip below freezing do. Calcium chloride (CaCl) can actually become a safety hazard when tracked indoors. When CaCl dissolves after absorbing moisture from the air, it becomes very slippery especially on tile floors. Many businesses have moved away from CaCl for this reason. This picture is a perfect example of excessive salt. This was taken on a clear and sunny day without snow or standing water that had a potential to freeze. No wonder the brown flooring inside was white with salt residue!